Get ready to feel inspired, because this Yale profes- sor just took interactive learning to a whole new level! If you’ve ever heard of the “Trolley Problem,” you know it’s a theoretical quandary that philosophers have debated in the abstract for years; that is, until Shelly Kagan brought it to life for his 2018 Bulldog Days Master Class by run- ning over five Yale prefrosh with an actual trolley! Hell yeah! Hands on learning for the win! In the “Trolley Problem,” you, a bystander, can either watch five people get hit by a rogue trolley, or take matters into your own hands by pulling a lever and redirecting it to hit just one. Tricky to wrap your head around, right? Not for Shelly Kagan! Every year, the renowned ethics professor has taught a Bulldog Days Master Class on the classic thought experiment. But this year, Shelly decided to kick things up a notch, really driving home the moral implications of such a decision. “I need 7 volunteers,” Kagan announced to the class, as he picked a handful of lucky students from the crowd in Battell Chapel and brought them up on stage. He instructed five to lay down stage left and one to lie down stage right, telling them not to move under any circum- stances. He then positioned the seventh pre-frosh behind the lever and recapped her options. 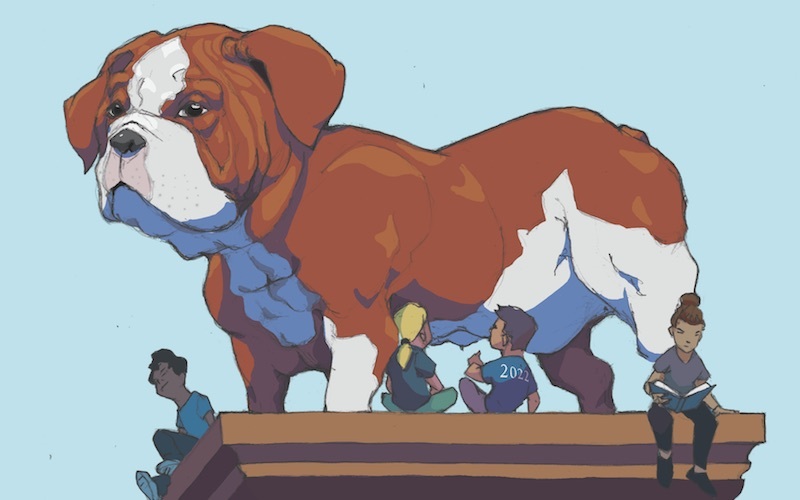 Finally, Shelly uncovered a massive cloaked streetcar in front of the lectern and yelled, “Class of 2022, behold my trolley!” before boarding the vehicle and mowing down future Bulldogs Mike, Tara, Susan, Molly, and George. To really drive his point home, Shelly even ran over the sixth pre-frosh that was supposed to be lying on a different track, and was making his way for the kid operat- ing the lever before he ran out of gas and threw a temper tantrum. Cool! Best of all, five more students off the waitlist will now have the chance to experience one of Kagan’s incredible lectures first-hand. Talk about an ethics lesson! Keep it up, Shelly. What Does Your Favorite Yale Study Space Say About You?